More than 3 million people have a cataract procedure each year. Thankfully, the process has changed significantly over the last generation. Patients don’t have to spend time in the hospital or face a lengthy recovery. A cataract procedure is now an outpatient procedure in which the clouded lens is removed and an artificial replacement lens is implanted in its place. The cataract correction procedure is performed in as little as 15 minutes. 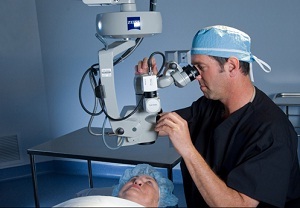 Vision improves immediately following surgery and recovery is complete within just a few days. On the day of the procedure, patients will have numbing drops placed in their eye and a local anesthetic is used to keep patients comfortable during their procedure. To prevent infection, the skin surrounding the eye is cleaned and strict precautions are observed to maintain a sterile environment. Don’t just take our word for it. Here are some comments from recent cataract patients: “My experience with the staff and with Dr. Solomon was excellent. I couldn’t have asked for better attention by the staff or the Dr. I would recommend everyone to go see Dr. Solomon for their cataract procedure.” – Ray Levkoff “Great service! Staff was tremendous and the medical experience overall was the best I have ever had! My wife is now wanting to get her cataracts removed now that she has seen that it was so easy.” – James Elmore “Dr. Solomon is the very best there is. He did my husband’s cataracts two years ago and I wasn’t the least bit scared. We live in North Augusta and drive 3 hours each way to see him and as far as I am concerned, there is no other cataract surgeon out there. I wish I had another cataract so that I can come to see him again. We couldn’t have asked to be treated any better.” – Kay Barton Connect with us on Facebook to see more patient testimonials and photos.